Lucie has been doing a wonderful job keeping up with our daily travels. I've decided I would add some "specialty" posts, the things I've discovered that might be of interest. I also need to practice writing blogs again, so it feels good starting with a topic where I am comfortable. 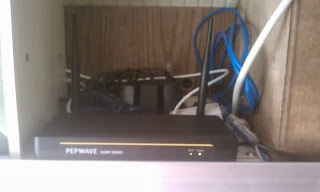 For this first post I will describe the mobile WiFi setup we are using to stay connected to the Internet as we travel. I designed this so we would be able to have WiFi as we drive down the road. My inspiration is what is advertised (but seldom a reality) on Amtrak trains and the Mega Bus. I ended up ordering from the 3G Store, not only because they had packages specifically for RVs, but because the online reviews spoke highly of their technical support. After designing the system and coming up with what I thought I should purchase I called their tech support line and confirmed that I was getting what I needed. As we drive down the road we use the cell towers to keep our devices connected through our own internal wifi network. Cellular Data plans are expensive and we needed to be able to afford to use this system so I ended up settling on Verizon, which we purchase through Millenicom for $70 for 20 Gigs a month. The device that this system is based upon is the Pepwave Surf SOHO. This is very similar to a home WiFI router. It has a WAN port that you could hook up to a DSL Modem or a Cable Modem, it then takes that Internet connection and shares it with all of your devices through a private WiFi network. In addition to the WAN port (which is an Ethernet port) the Surf SOHO has a USB port that supports a large number of USB Cellular Modems. This USB Cell Modem is how we stay connected to the Internet as we drive down the road. There are at least 3 companies who make these combination Cellular/DSL/Cable routers. I chose this one because it monitors how much bandwidth we have used through each of our connections to the Internet. This way we know when we are approaching our 20 Gig monthly limit. Also all of the equipment needs to be able to run from the RV's 12 volt electrical system, so I added a 12 volt adapter for the Surf SOHO. Sorry for the poor quality of the photos, my poor old HTC phone just can't take a low light picture. Maybe next time I'll get Lucie to take the pictures on her iPhone! The MiFi 4620LE Hotspot that Millenicom supplies with their 20 Gig Plan has a reputation for being unreliable and having to be rebooted for it to remain attached to the cellular network. I decided to replace it with a Verizon Pantech UML290 cellular modem. I removed the SIM from the MiFi 4620LE Hotspot and placed it in the UML290 cellular modem. Because the Sim slot in the UML290 cellular modem is a different size I needed an adapter. The MiFi 4620LE Hotspot is battery operated, so if we wish we could put the SIM back in it and take it with us to the beach or some other remote spot and have access to the Internet (if you know Lucie you will understand why this is a consideration). 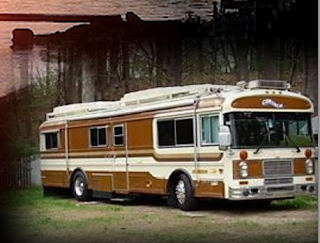 Our RV is made by the Bluebird Bus Company, which makes school buses, and is clad with riveted solid steel. It blocks most cell signals. 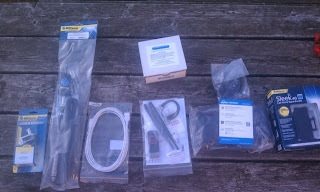 Because of this we need an external antenna, which I have mounted to the roof of the RV. Because this antenna is now the highest point on our mobile home I got a 21' Omni RV Antenna with Spring Base so if we hit a tree branch it won't break off. The antenna receives both 3G and 4G signals, and is tuned to the frequencies Verizon uses. 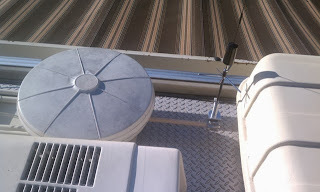 The antenna in its traveling position. It is the black and silver device that is casting a shadow on the storage pod. There are many locations where the cell signal isn't strong enough for a good data connection. There are devices called Cell Boosters that amplify the signal from the antenna to the cell modem and amplify the signal from the cell modem to the antenna so it can reach a cell tower further away. Right now the cell booster market is in transition. Because of changes in FCC regulations many older cell boosters are no longer being made (they would blast over the cell tower's signals interfering with normal reception). The Wilson Sleek 4G-V Signal Booster for 3G and Verizon 4G LTE is one of the few on the market now that follow the new FCC rules. It is tuned specifically for Verizon's 4G frequencies. This is what the booster and cell modem look like mounted in one of the overhead cabinets. The cell modem is rubber banded to the booster. 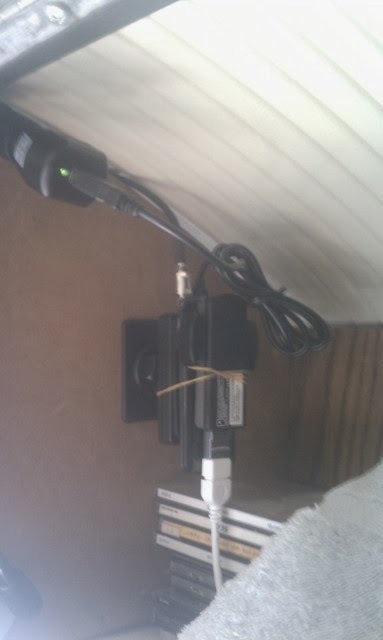 The booster is plugged into the RV's 12 volt system and connected to the antenna on the roof. The cell modem has a USB cable (white) which connects it to the Pepwave Surf SOHO in another compartment. So that is the system that allows us to travel down the road with WiFi in the RV. One other feature of this system, that is actually more useful when we are stopped at a campground is that it can automatically switch between several sources of Internet connectivity. Many campgrounds offer WiFi for their campers. The quality of this campground WiFi sometimes isn't up to the task. For several years now I have used an EnGenius ENH202 R to make the most of campground WiFi. This device is mounted on the roof and uses an Ethernet cable (using Power Over Ethernet (POE)) to bring an amplified WiFi connection to the WAN port of the Pepwave Surf SOHO. The term people are using for this type of connection is WiFi as WAN. The Pepwave can be set to use the campground WiFi until it looses the Internet and then automatically switch to the more expensive Verizon Cell modem connection. A note on the current EnGenius ENH2020 R - the company seems to have switched to a directional antenna and it no longer can perform as a client router. For this reason I don't believe I would choose the new version. This system has worked well driving down the road. There are some spots where there just isn't a cell signal. In those instances we just have to wait until we get out of the valley or over the ridge then our Internet comes back. So far every campsite we have had has had a good enough cell signal for email reading, blog posting and web surfing. Just don't click on the video until we get campground WiFi.